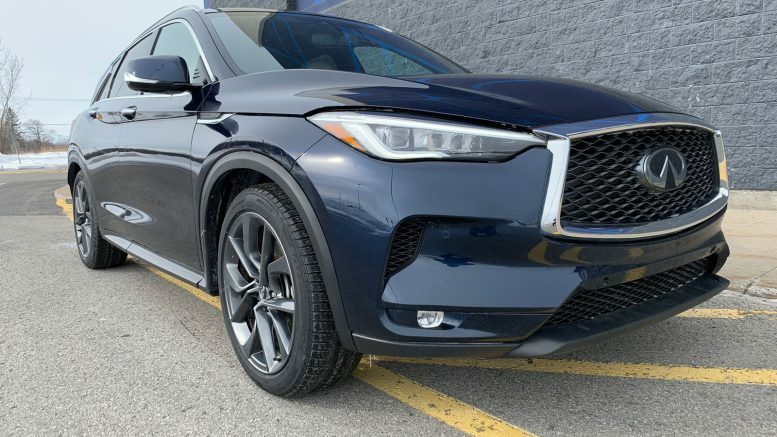 When an automaker characterizes something as “the most important vehicle we have ever launched”, that sort of language is bound to turn heads and make people take notice. 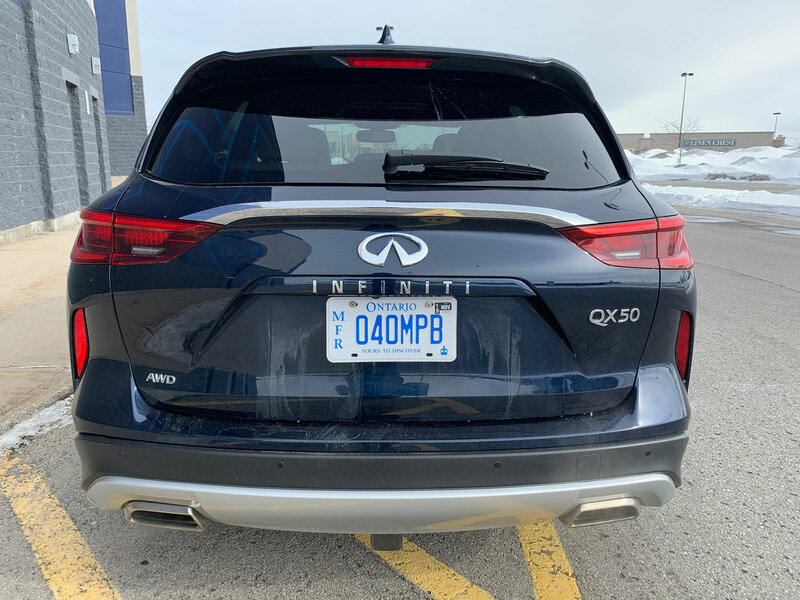 The QX50 was long overdue to be overhauled with an outdated-looking predecessor first introduced as the EX35 in way back in 2008. 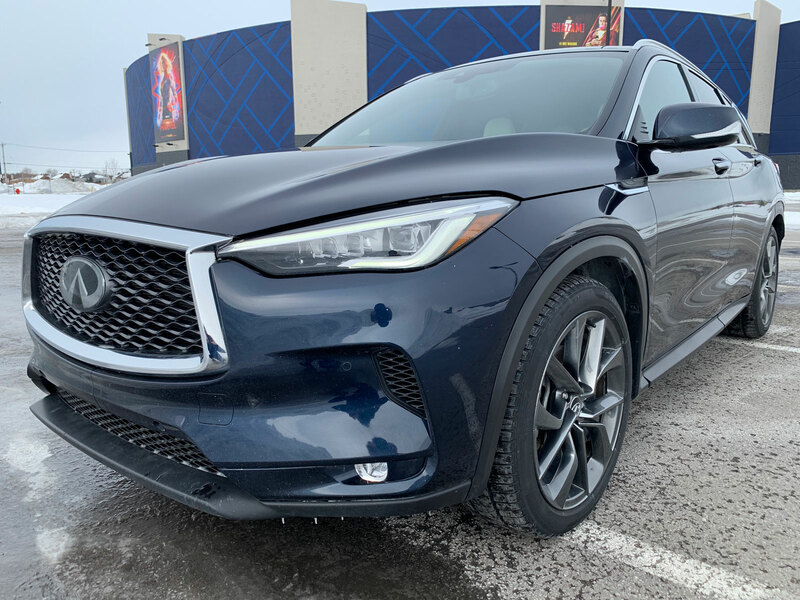 First unveiled at the 2017 Los Angeles auto show, the new 2019 QX50 was indeed a big deal as Infiniti had said. It was not just a light update or a refresh but a totally new vehicle and platform. 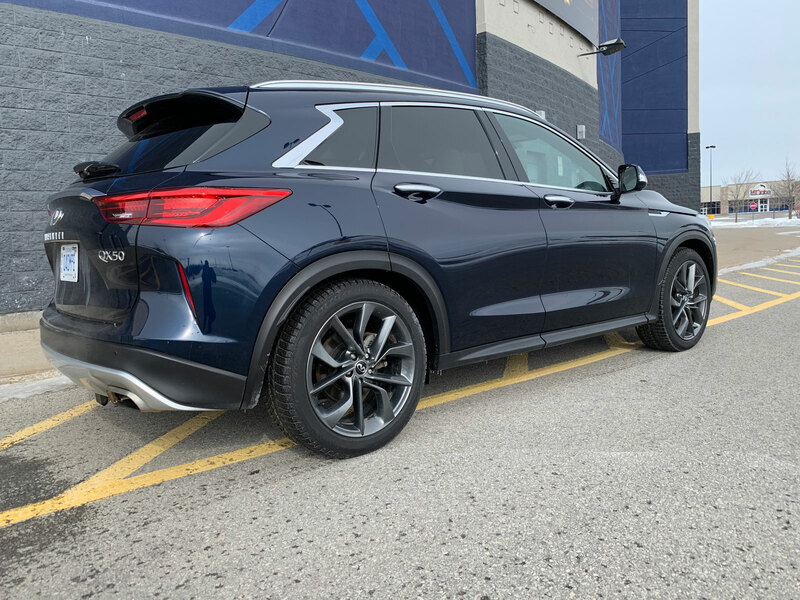 The compact crossover segment in which it sits is on fire and seems to be what everyone wants these days so the brand rightly put a heck of a lot importance on getting this one right. Under the hood we find the world’s first variable compression ratio engine in a production vehicle. The 2.0-liter VC-Turbo engine adjusts its compression ratio to optimize power and efficiency. 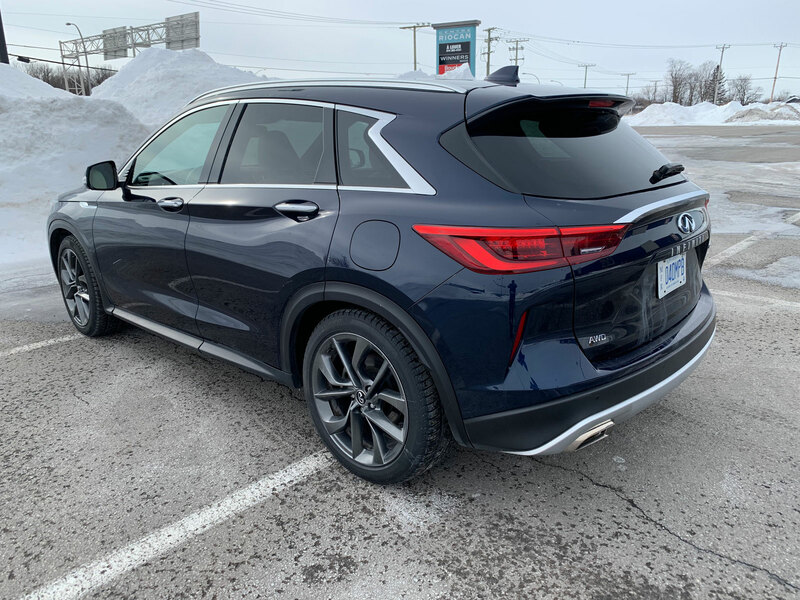 It combines the power of a 2.0-liter turbocharged gasoline engine with the torque and efficiency of a four-cylinder diesel engine and puts out 268 horsepower and 280 lb-ft of torque. 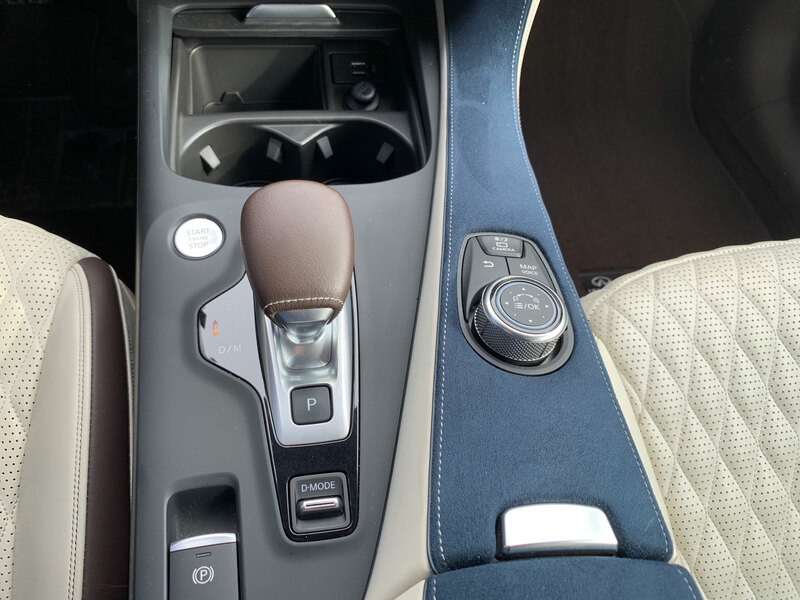 Unfortunately, the vehicle comes with a CVT or continuously variable transmission which is a bit of a downgrade from the previous 7-speed automatic. CVTs aren’t the most prolific performers but the car was still quite quick off the line. There was some hesitation and annoyingly high revving at times when I pushed the 2.0-litre motor but for the vast majority of people buying this car it’ll be just fine. 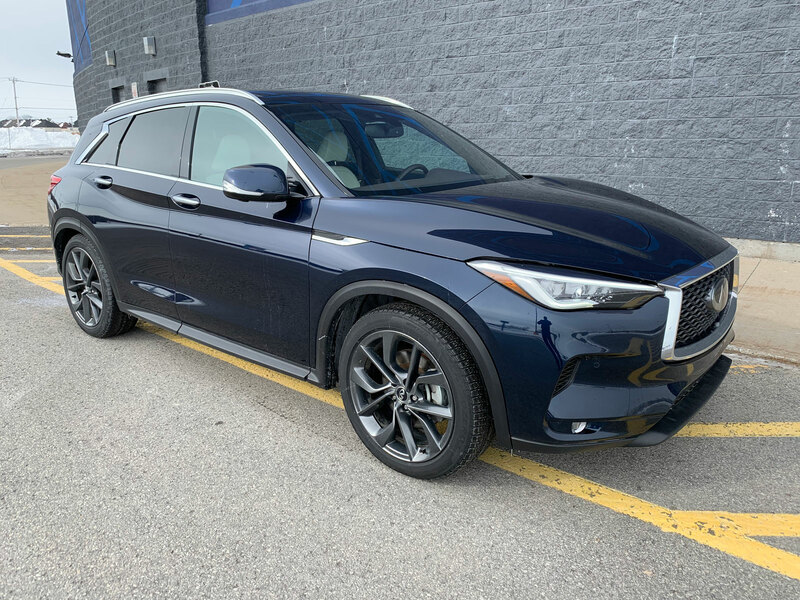 The QX50 handles extremely well but not quite at at the same level of enjoyment as the previous model. Again, for most people it’ll do. 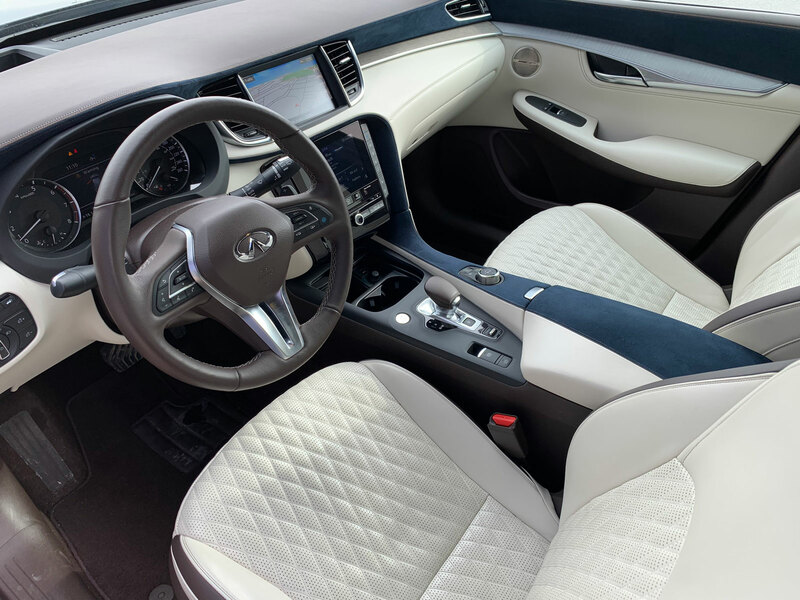 The interior of the new QX50 is what will likely win over most potential buyers. When I posted the photos on social media there were a plethora of comments about how nice it was. Even my own first impression was that it was one of the nicest I’ve seen for a crossover. The diamond-stitched leather seat pattern and navy blue suede on the center console really stand out. All of the material surfaces are of the highest quality with either leather, brushed aluminum or suede. Furthermore, the shape is unique and ergonomically perfect. The controls are angled slightly toward the driver and everything is exactly where it should be for easy reaching without having to lean. Even the paddle shifters are located on the steering wheel rather than the steering column. 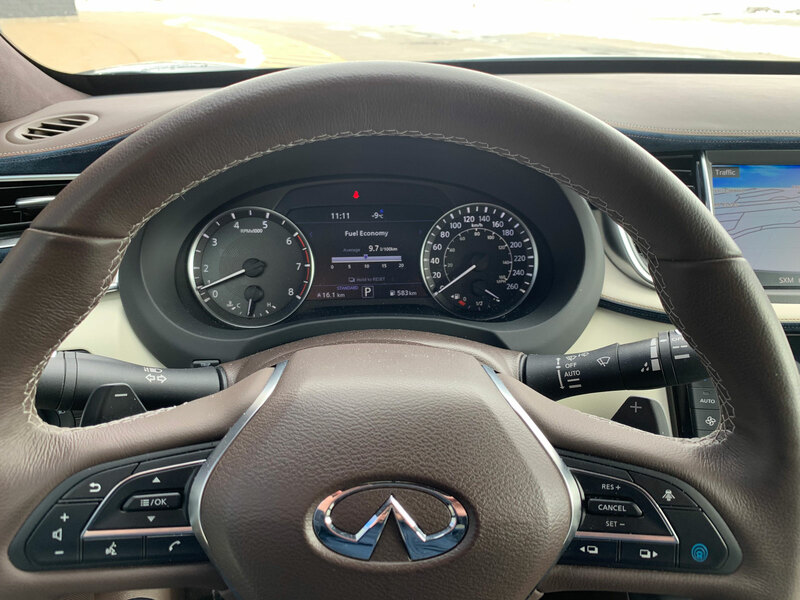 Infiniti’s infotainment system is fairly easy to use which a combination of physical buttons and touch screen functionality. The engineers rightly decided to have climate controls have their own buttons because nothing is worse than screen tapping when you want to make quick changes to fan speed or temperature. 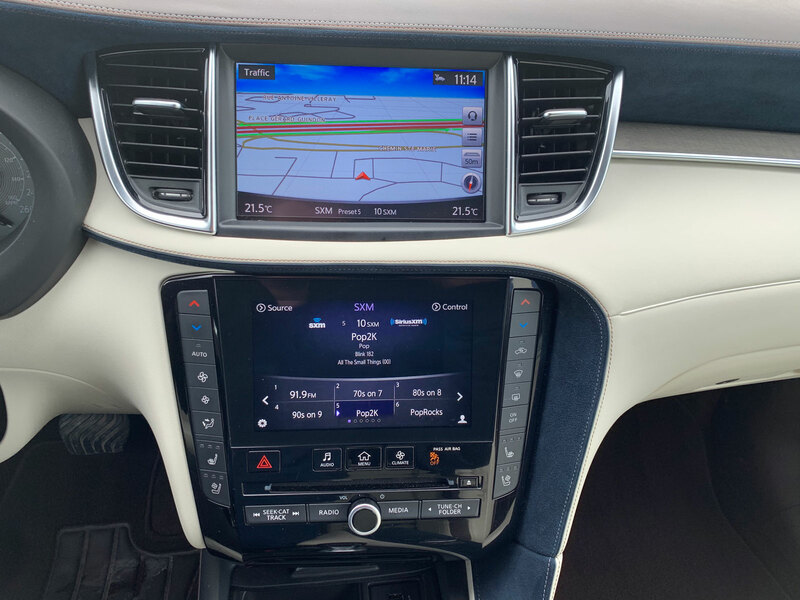 The problem is the lack of Apple CarPlay and AndroidAuto in the year 2019. These features have become almost a requirement for any young-ish person when purchasing a vehicle so I’m just not understanding Infiniti’s decision to leave them out. Interior space is very good for this compact. 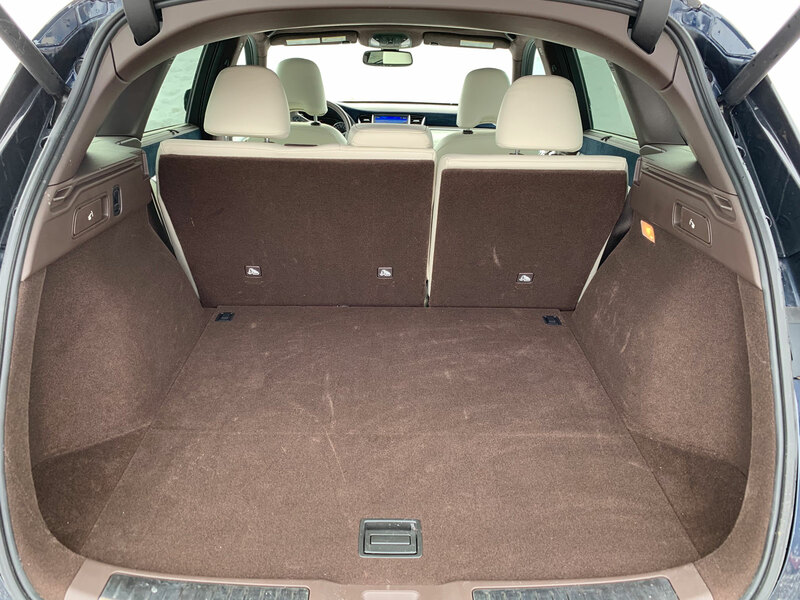 It’s one of the few vehicles in its segment to offer sliding second-row seats and boasts rear legroom of up to 38.7 inches. The trunk accommodates three golf bags, or a stroller situated length-wise, with space for additional cargo. Hidden under-floor storage compartments can be used to stow valuable items, or wet and muddy clothing. 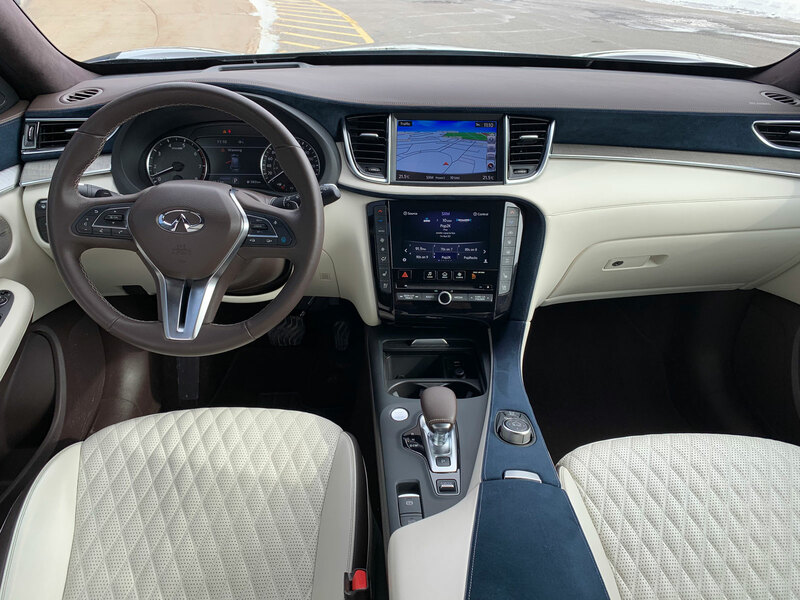 As nice as the interior is, one could similarly say the exterior is a beautiful rendition of the modern compact crossover. It’s not too flashy but far from bland. Infiniti’s new design language seems to have been made for this type of vehicle. 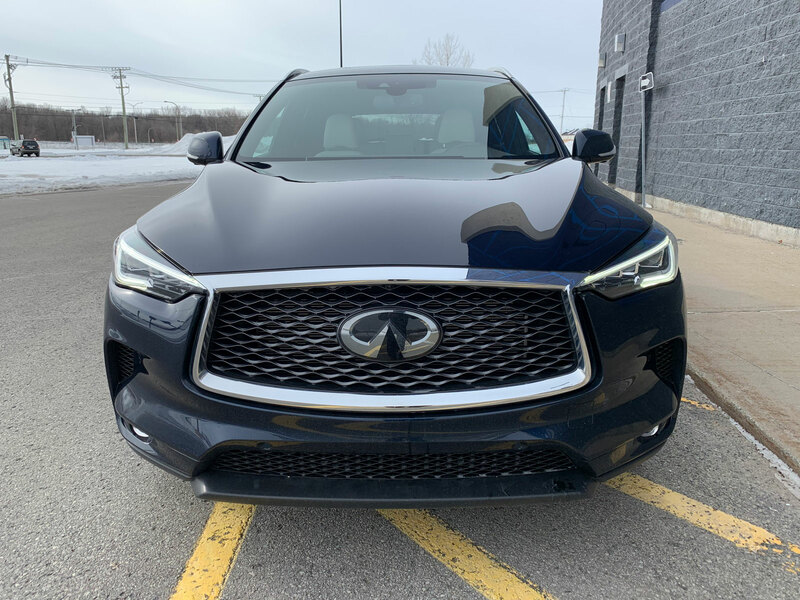 The brand’s double-arch grille gives the face of the 2019 QX50 a unique and distinguished appearance which compliment the LED headlight design, which emulates the human eye in its appearance. The rear is similarly very up-scale and warm. 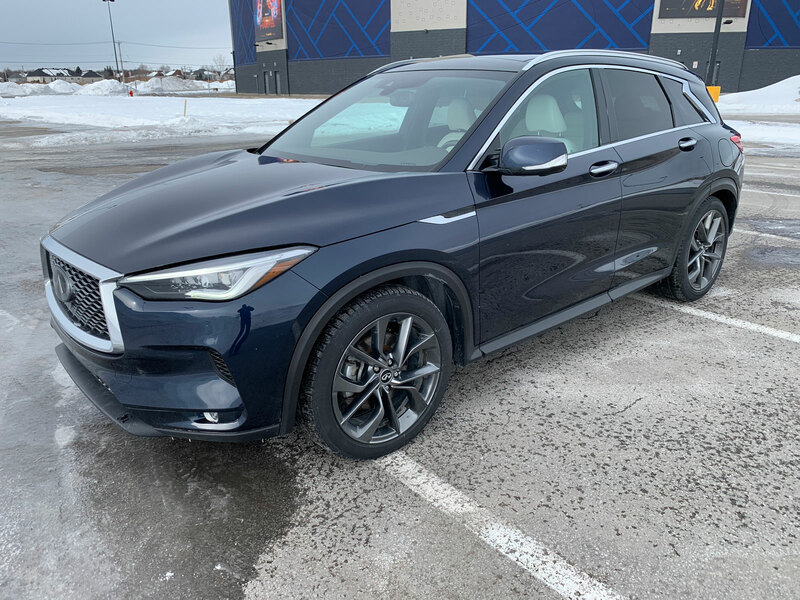 The 2019 Infiniti QX50 starts at $46,650 for the entry-level Luxe trim. 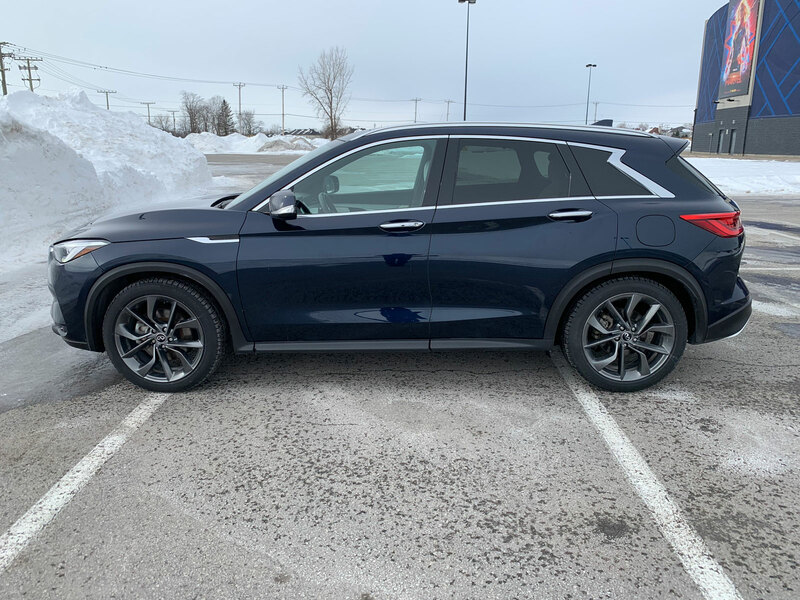 Keep in mind that all QX50s sold in Canada come standard with all-wheel drive which is a nice touch. 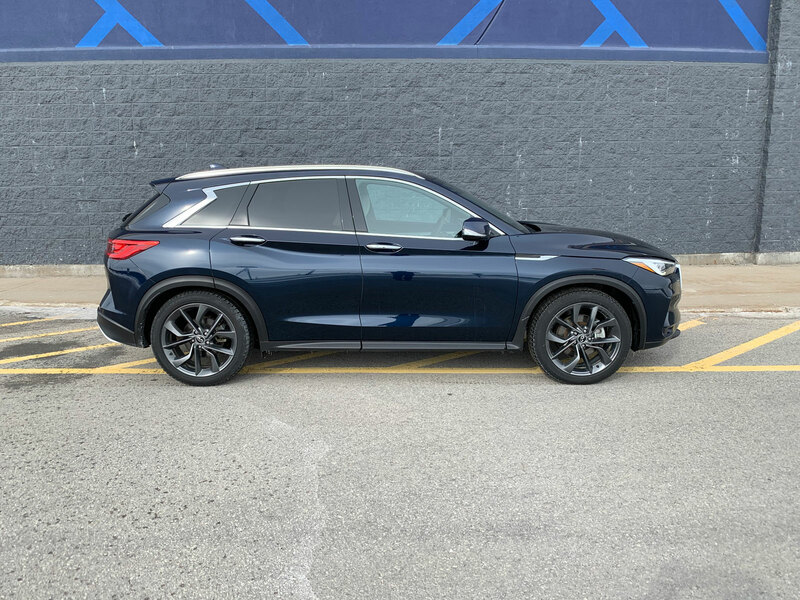 Upgrading to the Essential trim at $51,150 will give you leather, parking sensors, tri-zone climate controls, additional power seat settings, rain sensing wipers and moving object detection. The Proactive at $58,650 adds heads-up display along with a host of safety and autopilot features. Sensory adds 20-inch wheels, a Bose sound system, hands-free power liftgate, premium leather, and unique headlights. 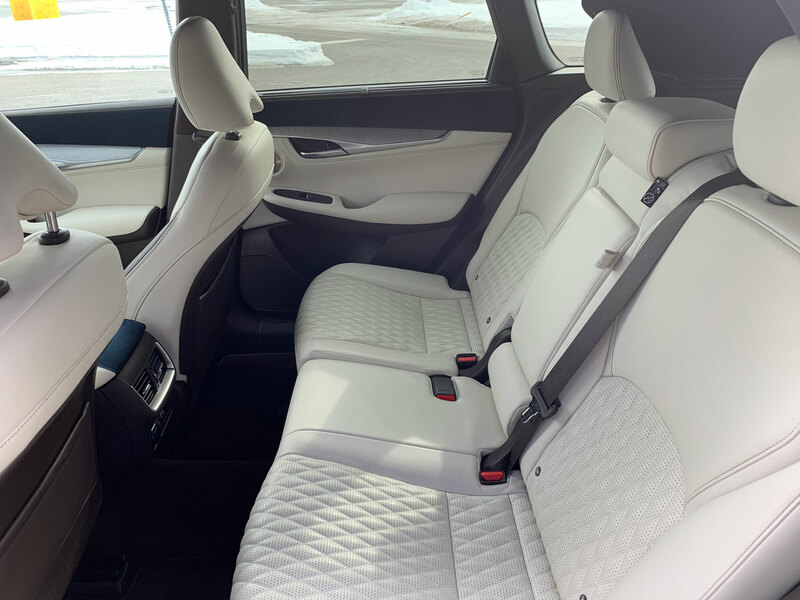 Autograph tops out at $60,150 and has even more premium white leather seating and blue ultra-suede surface materials.